Cheltenham manager Gary Johnson says they have renewed "hope" of remaining in the Football League following their 3-1 victory over Cambridge. The Robins ended a run of nine matches without a victory to move off the bottom of the League Two table. They are now one point adrift of 22nd-placed Hartlepool United with three games remaining. "I've been pushing and shoving for that sort of performance," Johnson, 59, told BBC Radio Gloucestershire. "It's going to go down to the wire, but we've got hope now, because we've seen that these lads have set a standard - and this is the standard we have to keep to." The Robins now face a trip to Northampton, a home match against promotion-contenders Shrewsbury and a final-day contest at AFC Wimbledon. 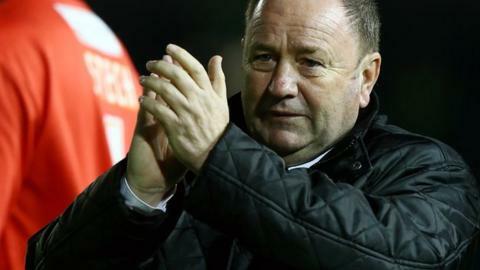 Former Bristol City and Yeovil Town boss Johnson, who secured his first win as Cheltenham boss in his fourth game in charge, said he was "pretty sure" three wins from three would be enough to secure survival. "They needed to put on a performance that looked like they were attacking with intent," he said. "And that was proper intent. "That was a proper football team trying to play, with a crowd getting behind them because they knew they were giving 100%, not only in effort but in quality. "I'm really pleased we've got them to this level pretty quickly."